The war between the Alliance and the Horde is about to explode, but in the conflict appears a strange island hidden for millennia, and populated by a strange warrior race : the Pandaren. In this new expansion, a whole new continent reveals itself for players to explore and introduces the Pandaren as a playable race . For millennia, this tough breed of warrior monks have remained hidden , but after the events of the Great Cataclysm, Pandaria wandering heroes take a step forward to swear allegiance to the Alliance or the Horde. Besides the new monk class are incorporated. In addition to the new continent , also comes with "challenge" dungeon mode, the grieving pet , the maximum level is 90 , new talent system and a lot of equipment for our heroes. 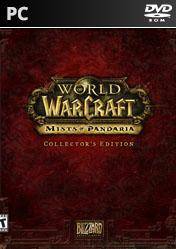 This edition also includes DVD and Blu- Ray " Between racks " : Discover the secrets of the creation of Pandaria with these two discs over an hour with commentary and interviews with developers. The soundtrack of Mists of Pandaria . The book "The Art of Mists of Pandaria ," the custom beer Thunder Chen , a mount for World of Warcraft with which we can take to the skies of Azeroth astride the imperial mystique flying mount . It also includes a Quilen pet, portraits for Battle.net StarCraft II and Diablo III banner which will demonstrate that you are a true hero of Pandaria .